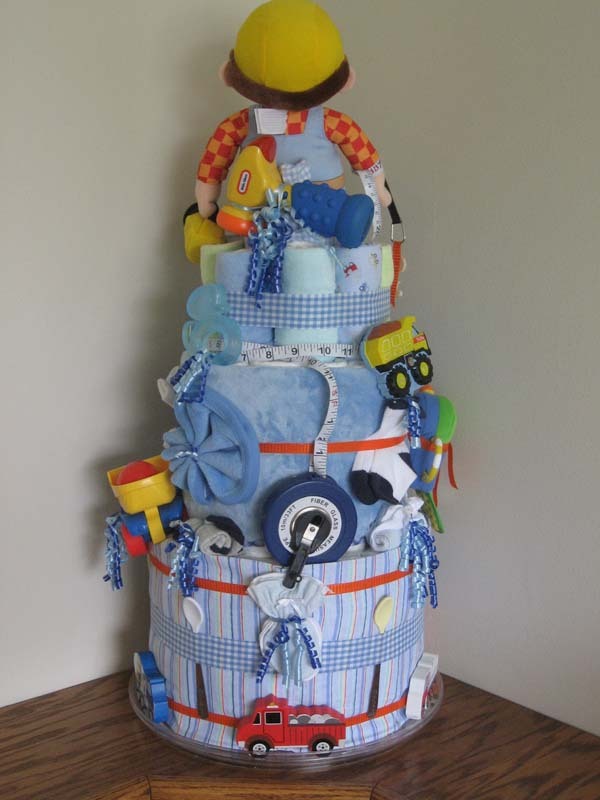 Under Construction Diaper Cake - What an Adorable Diaper Cake Theme! 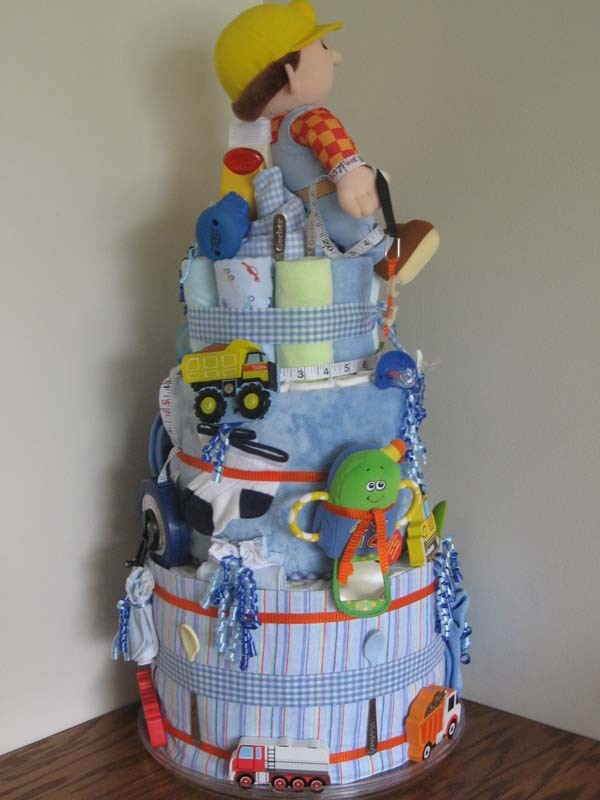 First of all, I think that the Under Construction diaper cake theme is adorably clever! 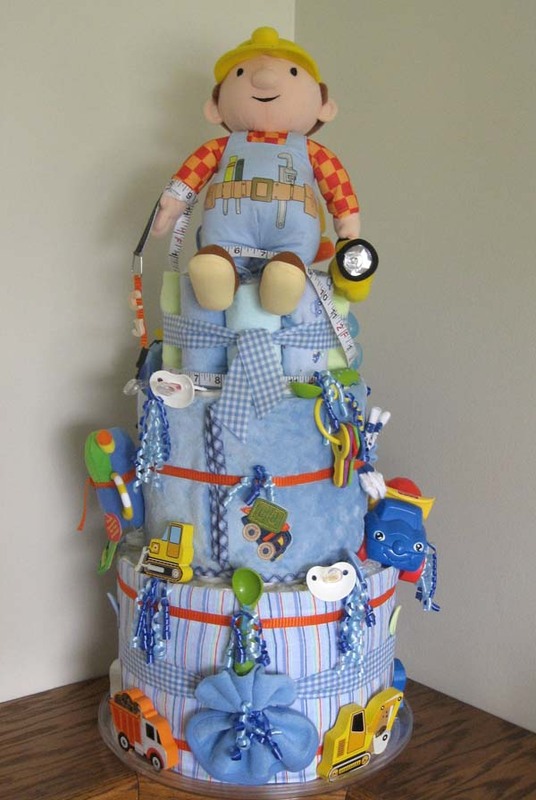 (a baby is under construction) And second, this Bob The Builder and Teddy Bear diaper cakes are very well made, with all the trimmings to add to the 'Under Construction' theme. 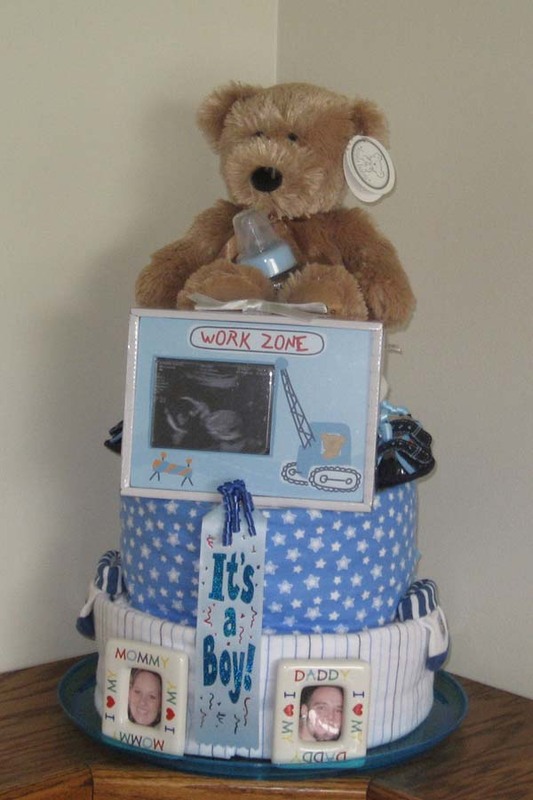 The colors and theme make both of these cute diaper cakes perfect for a little boy baby shower. These two delightful diaper cakes both come from the same creative person, Dorothy! She is one of our many readers who have shared their diaper cake creations with us and who is another fabulous example of why this website is your greatest resource for diaper cake inspiration on the web! I also have to mention how much detail Dorothy included in her diaper cake recipes that are included below the pictures! Talk about a lot of useful hints and information!Thanks so much Dorothy! So helpful and so cute! I too found your site by looking for shower ideas. That's when I learned of Diaper/baby Cakes. I was not giving the shower myself, but decided I wanted to make a diaper cake. This was three years ago, for my grandson's shower. I went off the shower Reg. for the items to use for the cake and also added other stuff. The big cake was the first one I made. I rolled the diapers for this cake and used a cardboard gift wrap roll for the center and glued it to a dollar store plastic round plate. With another plate underneath as the cake was heavy! I bought a case of size 1 pampers swaddler diapers..... so I had a lot of diapers to try and use! The bottom layer is 2 layers high of diapers covered with 2 burp clothes, the second layer is also 2 layers high of diapers covered with a blanket, the top is a rolled crib sheet in the middle and rolled diapers covered with wash cloths and 2 rolled burp clothes, I used pins, rubber bands and ribbons the only tape used was to tape the puzzle pieces to the ribbon. The small cake was a last minute cake to use more diapers up and other items I had bought and did not use for the big one. I used the other method for the diapers! (I like the rolled method better) 2 rolled receiving blankets for the inside and a bottle from her reg. Receiving blankets cover the bottom 2 layers. I had no real pattern to follow as I purchased the items then just played a round to incorporate them into the cake. I found my self running out to the stores to get more stuff. Still had left over diapers and items! They were costly! But had fun doing it! Just decided to send in. I like to go into the site to look at other pictures! I have made more cakes since! Fun to make and to to see what you can come up with! 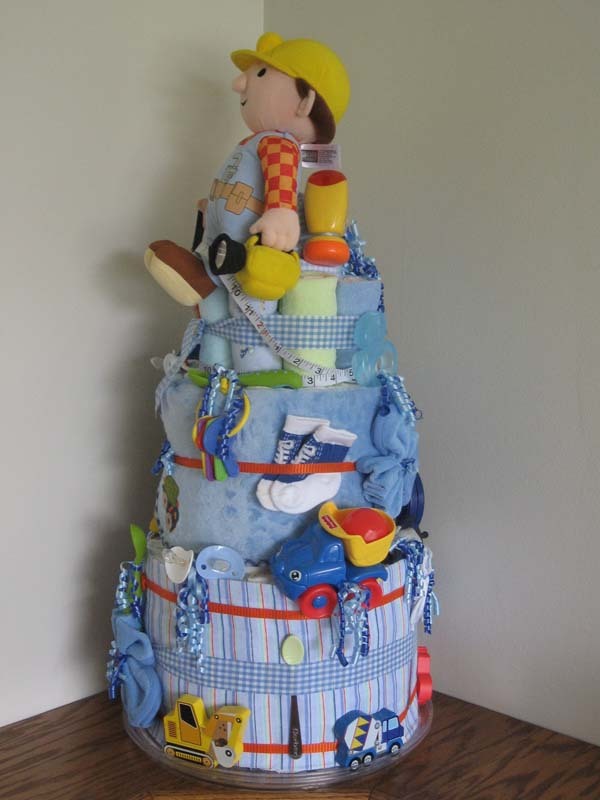 Thanks for sharing your fantastic diaper cakes, Dorothy! They are amazing!! 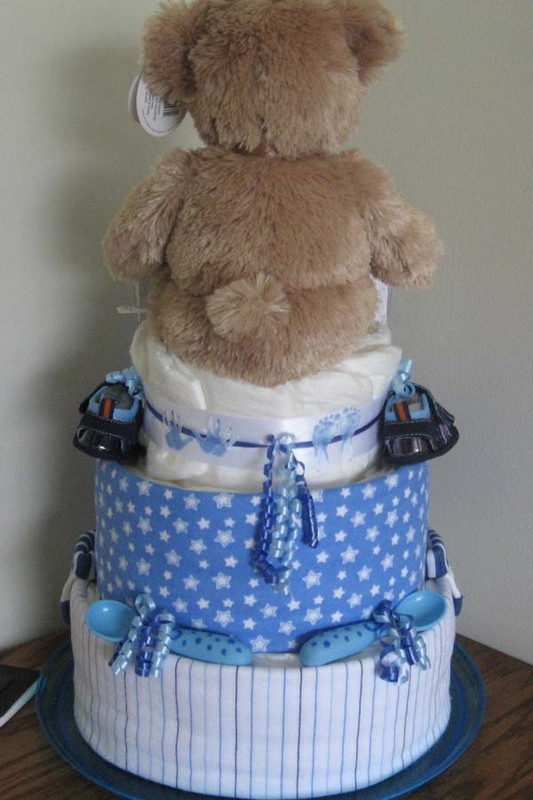 Want to learn how to make your own baby shower diaper cake? Click here for easy-to-follow diaper cake directions.